Lord Mervyn King, Distinguished Visiting Professor at NYU and former head of the Bank of England, spoke to the Stern community. 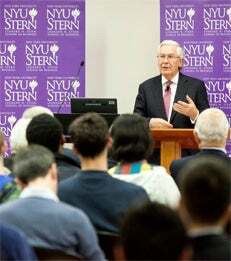 Lord King, Distinguished Visiting Professor at NYU and former head of the Bank of England, recently spoke to NYU Stern faculty and students at an event hosted by the Center for Global Economy and Business. Dean Peter Henry welcomed Lord Mervyn. The Center for Global Economy and Business is led by Professor Kim Schoenholtz. On November 6, Lord King will again speak to the Stern community at an event entitled, “Making Banks Safer,” with Stern Professor Thomas Cooley and Anat Admati from Stanford University Graduate School of Business.